Hi Stampers! Another quick post for you today - I have lots to catch up on in the studio today since I haven't stamped since last Friday! A quick update for you on my Dad, he is still in the hospital but improving after one procedure. We are still waiting to see when his surgery will be, but after seeing him yesterday, he looks and sounds 100% better than he did on Saturday. All my plans for the week are still on hold until we know more, but since he is stable, I'll deal with that! 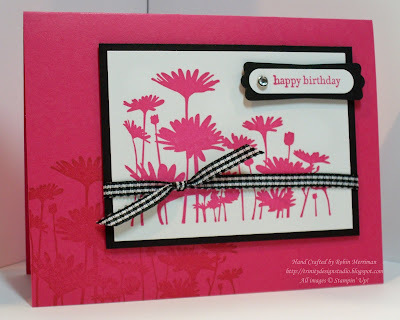 Today's card was heavily cased from one of my stampin' friends Kay Kalthoff who is also one of my GoDivas swap group. When you view her original card at this link here, you will see that I didn't change much about this card at all - it was really eye-catching just like it was! Plus the gals at Just Cards class and my workshop last week just loved it! Have a great day everyone! I'll be working in the studio today, sticking close by the phone, so I should have some new creations for you to look at for my design teams over the next few days, so be sure to come back! And thanks for all the prayers for my Dad - we feel every one of them! I am glad that your dad is improving! I also love this card, too. I like both versions, but I think that I like the minor changes you made to the original better. I think I'm gonna have to get this stamp set! First of all, add my prayers for your dad, too. And secondly, thanks for casing my card!!! I feel so honored that I've inspired you and so glad your customers loved making the card! Fun, fun, fun!! Thinking of you Robin and hoping your dad continues to feel even better.